No, this is original. Uh not representing any of the well-known characters -- Sailor Moon, Faye Valentine, Motoko. 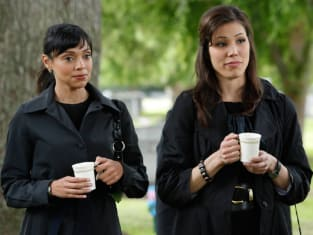 Bones Season 4 Episode 22: "The Girl in the Mask"
Sweets: The mask could have been used by the killer to dehumanize the victim, allowing whoever decapted her to distance himself form the ugly reality of her death. Dr. Tanaka: Mmm, you are entering the realm of psychology, an field of unverifiable speculation. Perhaps I could be of further help to Dr. Brennan. Sweets: Sometimes I hate hard science. I know that seems immature, but thats just how I feel.